Hello EmSims81! First things first, how long have you been playing The Sims and what got you started? Hello Sim Serendipity and fellow Simmers thank you for asking me to do this Q&A with you for The Sims Community, I’m very excited about it! I have been playing The Sims for around 15 years now and I still love it so much! A family member brought The Sims around for me to play not too long after it was released all those years ago now and I have been addicted ever since! lol! I will always have a special place in my heart for The Sims, 2 and 3 but I think my personal favorite is The Sims 4. I love how the Sims are more realistic in The Sims 4 with all the Emotions players can experience through their Sims. The Emotions make playing the game so much fun! 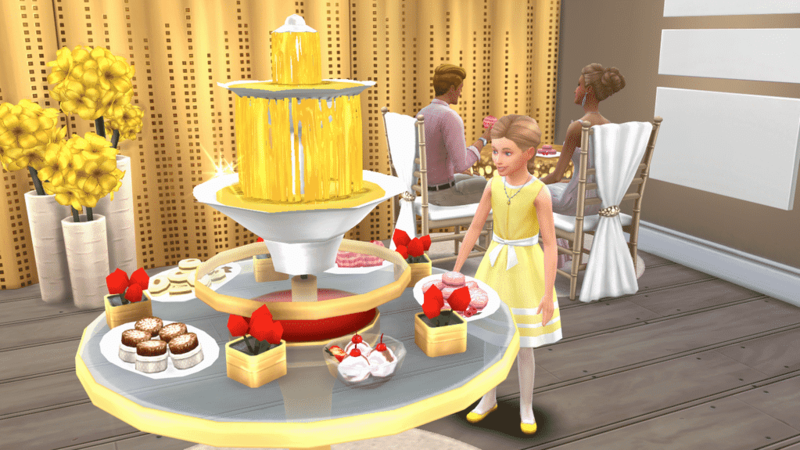 Are you excited about the next expansion pack – The Sims 4 Get Together? If so what bits have appealed to you from the information released so far and what we have seen in the trailer? I’m so excited for Get Together! It looks so amazing! I’m most looking forward to seeing what the new EP brings to game play with the new social groups and I can’t wait to see more of the new world Windenburg! Plus, the new Clothes, Hairstyles and Objects too! We know a lot of people enjoy your tweets and follow your Sim stories, what was your inspiration and what made you begin your twitter journey and share your content with the world? Thank you so much, I’m so glad fellow Simmers enjoy my tweets and the stories I share from my Sims! I have been playing The Sims for many years now but I wasn’t sure about social media and then one day I thought why not give it a try! So I did! I just love to take screenshots of my Sims in their everyday lives and share these moments with my followers on Twitter. I guess it’s the photographer in me! I love to make sure everything is just perfect and that the Screenshot tells the story I want it too! I think my inspiration is my love for The Sims 4, I really enjoy it so much!I’m always so touched by all the wonderful comments I get from all the lovely Simmers. I have met so many nice Simmers and I enjoy talking to everyone! 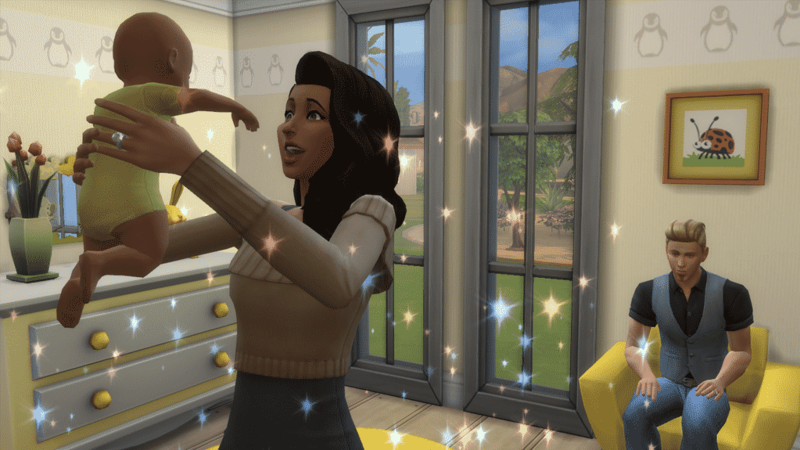 I always have moments of where I’m like I can’t believe fellow Simmers love my screenshots as much as I do! But I’m so thankful they do! The Sims 4 has just celebrated its one year anniversary and is releasing new and exciting content frequently, what would you personally like to see in the future and why? I can’t believe The Sims 4 has been out for a year already! 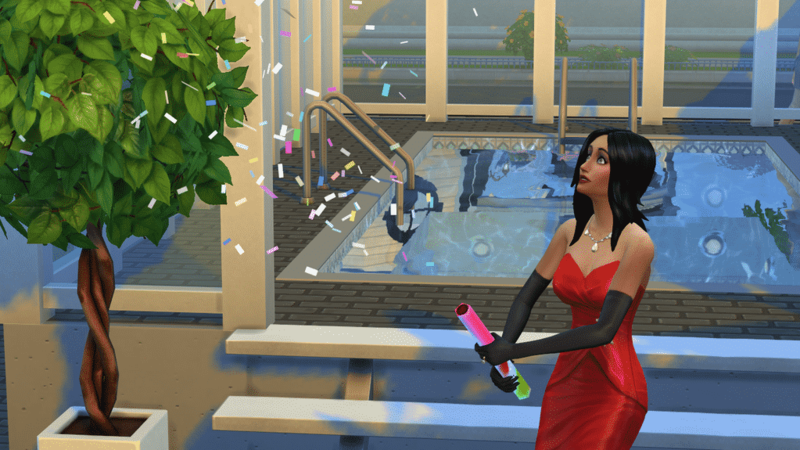 Happy Birthday to The Sims 4! I would really love to see more EPs in the future like a supernatural one, I think given the emotions it would make for such amazing game play! If we had Vampire Sims or Werewolves Sims they would be so fantastic in The Sims 4 plus maybe lots of new objects and build items too! I would also love a Seasons EP, I think given how beautiful the Worlds are now can you imagine what they would look like with all the Seasons? They would be even more beautiful! I would also like a few more traits added like a Vegetarian Trait etc and also a few more aspirations would be so great too! We all love this new baby moment, what a perfect picture! This Sim appears to be saying hello to her new Voodoo Doll! We all love it when the cake gets cut at a wedding! 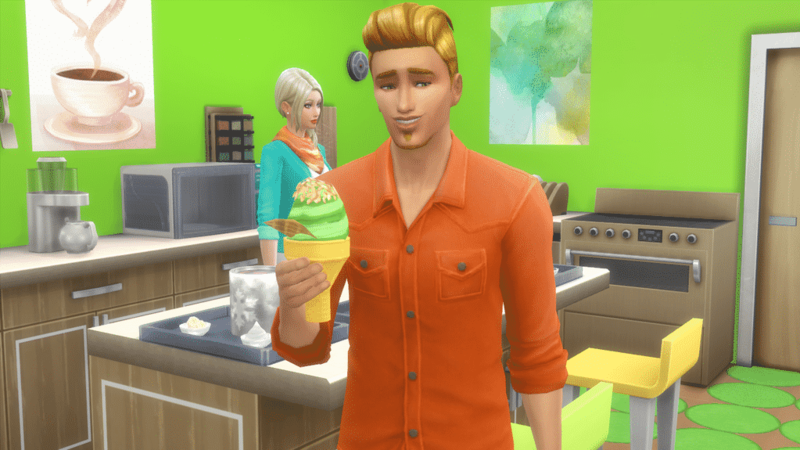 Gotta love that new Ice Cream Maker, EmSims is spoiling you! 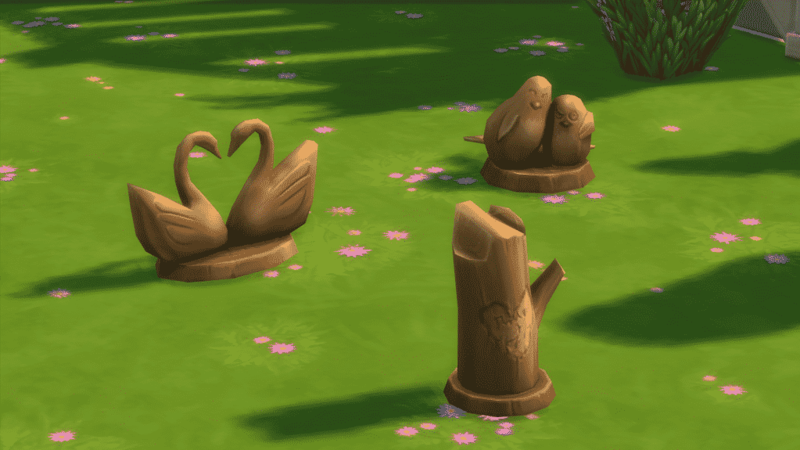 This Sim was in a flirty mood when making these sweet wood carvings! I think this Sim is in a bad mood doing the angry sim walk! Celebrating The Sims 4 One Year Anniversary! Ice Cream or Ice Lolly – Ice Cream, Soya Ice Cream of course as I’m a Vegan! Books or Magazines – Books, I’m such a Bookworm! Cake or Crisps – Crisps I guess although I don’t really eat any of both them!